Two channels into one ! Expert sleepers has announced Merger, a utility plug-in that combines two audio channels into one. This is typically useful for e.g. vocoder plug-ins that expect their two inputs on either side of a stereo pair. 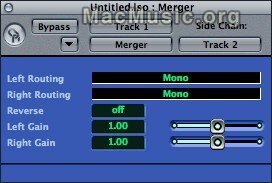 Merger is available as a free download.